In May 1921, the first Salon du Gout Français (SDGF) was held in Paris at the Palais de Glace. 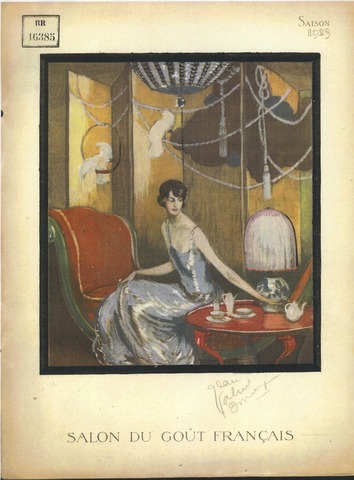 Inaugurated by publisher Maurice Devriès as an initiative to boost a French economy still suffering from the effects of WW1, this exhibition of French luxury commodities, from cars to couture, traded on the country’s historic reputation as the ne plus ultra of taste and style. Trade shows, fairs and expositions were nothing new, but Devriès’ innovation was to display the exhibits virtually, as images produced by autochromes, a colour photographic process invented by the Lumière brothers and launched by them in 1907. The large glass positive plates, when mounted in back-lit vitrines, glowed with translucent colours (one visitor compared them to stained glass windows), producing a magical effect that enraptured visitors to the Paris Salon and those in North America when they were exhibited at the Egyptian Hall at Wanamakers’ Department Store in Philadelphia, among other venues, between October 1921 and March 1922. Later in 1922 this spectacular enterprise took off on an even more audacious sales ‘croisade’ around the world on two decommissioned battle cruisers. After sailing through the Suez Canal, the ships crossed the Indian Ocean to Australia and New Zealand, then sailed on to Japan, China and India calling in at major ports along the way where they docked sometimes for up to fourteen days. Contemporary newspaper reports attest to the excitement their arrival caused. Visitors were able to order the goods represented in the selection of autochromes on board, via a catalogue, directly from the manufacturers in France. Among the 2,045 autochromes that made up the SDGF collection, donated by Devriès in 1929 to the Conservatoire des arts et métiers in Paris, there are 441 plates of women’s fashions, 32 of men’s and 38 of children’s, plus around 360 of accessories, including hats, perfumes, lace, lingerie, fancy dress costumes and hairstyles. The womenswear includes models for town and for sport, evening dress and furs by many Parisian couturiers including Chanel, Patou, Drecoll, Worth, Jenny, Lanvin, Premet, Redfern, Beer, Doucet, Groult, Carette, Henry à la Pensée, Paquin, Prévet, Révillon and Weil. Jewellery by Van Cleef & Arpels, Boucheron, Chaumet and Desausoy was also exhibited. Significantly the SDGF preceded l’Exposition internationale des arts décoratifs by two years. Even more significantly the representation of the colour of the commodities exhibited in the SDGF was captured by the most accurate medium available at the time, and as such, the autochromes provide a unique snapshot of French couture between 1921-23. To my knowledge the collection has not yet been digitized, therefore only a dozen or so images from the SDGF are available. These are included in the paper, as well as some from an original catalogue for the exhibition and a variety of other contextual images.